Gum disease, also called periodontal disease, is a deterioration of the gums caused by plaque and bacterial growth. If left untreated, gum disease worsens over time, progressing through three stages. If you experience the symptoms of gum disease, it is important to get treatment as soon as possible to protect your teeth and gums. Gingivitis is the earliest stage of gum disease. In this first stage, plaque has built up on your teeth and along the gumline, and bacteria has begun to grow in that plaque. Gingivitis causes your gums to inflame and become sore. Gingivitis in its earliest stages may need professional scaling and root planing treatment from your dentist. Reversing gum disease at this point is much simpler than at the later stages, so you should visit your dentist to diagnose gingivitis as soon as you see the signs. Treating gum disaese at this early stage is key to preventing irreversible damage to the connective tissue and bone that hold your teeth in place. If gingivitis develops unchecked, gum disease progresses on to the second stage: periodontitis. At this stage, the bacteria begins to damage the bone and connective fibers that support your teeth. Your gums will begin to pull away from the teeth, forming pockets below the gumline that can collect food and plaque, allowing more bacteria to grow and cause further damage. If gum disease progresses to the periodontitis stage, it is essential to visit a dentist and begin a treatment plan to save your teeth. Daily brushing and flossing will not be enough to reverse the effects of periodontitis. The final stage of gum disease is advanced periodontitis. At this point, the tissue and bone that holds your teeth in place are severely deteriorated. Your teeth may loosen or become misaligned as the gums have pulled away and bone loss has worsened. 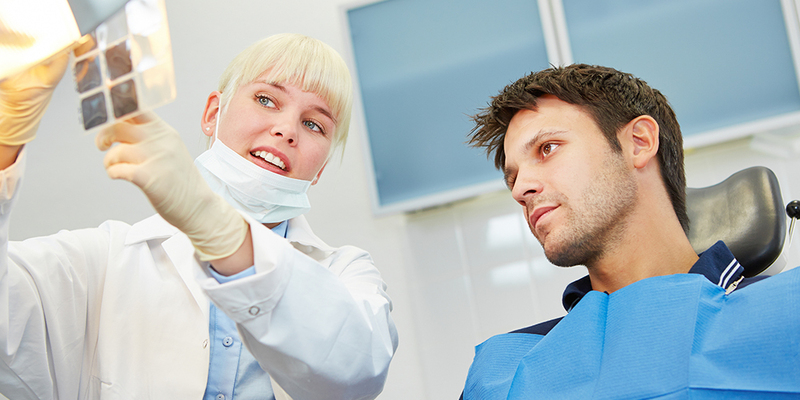 Professional treatment may save your teeth, but in some advanced cases, the teeth may need to be removed. Of course, the best treatment is prevention. Proper brushing and flossing twice per day, using a fluoride toothpaste, is the best way to keep gum disease from ever developing. However, if you are already experiencing symptoms, you should visit a dentist to come up with a treatment plan based on how advanced your condition is. Laser treatment is an excellent option for many patients. LANAP treatment has the same benefits of traditional surgery, without much of the hassle and unpleasant side effects. It is quick, gentle, safe, and effective. Learn more about gum disease, or contact Dr. Brad Dixon to schedule an appointment at our office in Gainesville, Georgia today.